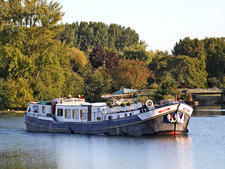 The barge has two suites and eight cabins, each with en-suite facilities. Wine, food, an open bar and all entry fees to excursions are included in the cruise fare. Excursions include a tour of the hidden gardens of Venice and a visit to the colourful fish market of Chioggia. The 140-foot barge has a dining room, saloon and sun deck. The ship carries 10 bicycles. The ship is crewed by a staff of seven, including the captain, four stewards, a tour guide and a chef.